OH! WHAT A LOVELY WAR « THE BRYCE IS RIGHT! – In just two months, we have gone well beyond just a war of words. President Trump has been in office for just two months and in that short time the activities in our nation’s capitol and around the country already reads like a Tolstoy novel. He began with an ambitious agenda, signing many executive orders that took the country by storm and alarmed the Washington establishment. In an attempt to slow him down and express their disdain, the Democrats boycotted the inauguration, moved slowly to confirm his cabinet nominees, and accused him of wrong-doing. They resisted just about everything in his recent address to the joint session of Congress. Democratic women flashed “thumbs down” signs and the rest basically sat on their hands to prohibit applause. In contrast, 70-80% of the country saw his speech as positive. 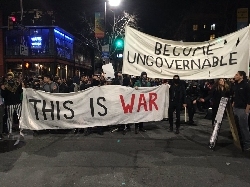 A “resistance” movement has emerged with organized demonstrations in the streets, Congressional Town Hall meetings that are loud and angry, and there have been some physical skirmishes between anti-Trump demonstrators and supporters of the president. There is also an open war between Mr. Trump and the main street media who fails to report anything positive regarding the president. Suddenly there are calls for investigations of alleged Russian relationships, wire taps by the Obama administration, leaks to the press, calls for resignation of Mr. Trump’s cabinet appointments, even calls for impeachment of the president. All of this is designed to discredit the president and sidetrack him, thereby rendering him impotent as commander-in-chief. True, Mr. Trump is fighting the ideological differences of the Democrats, but he is ultimately fighting the Washington establishment which views him as a threat to the lucrative relationship they have in the capitol. This includes Democrats, the press, bureaucrats, and lobbyists. There are even doubters in his own party who would like to see him disappear. All of this reflects the corruption of Washington, DC. Other indicators of our divisiveness can be found in the economic boycotts of companies and institutions supporting one political side or another. There is also the problem of repressing free speech on college campuses by the left, and their embracing of political correctness. The push back to Mr. Trump goes well beyond gridlock, bordering on insurrection. In order for him to survive, the president has to persevere and not allow himself to be distracted. Yes, he must call out his detractors and reveal their intentions, but he cannot afford to be sidetracked by them. This would be playing into their hands. Instead, he has to simply persevere. If he can correct immigration, health care, our tax structure, and pass a viable budget this year, he will not only have kept his campaign promises, but he will have gone a long way to make the country stronger, while taking the Washington establishment down a peg. In the process, he will break the liberal elements of the Democratic party and put it into a tailspin going into the mid-term elections next year. The Democrats are acutely aware of this, which is why they are fighting the president so vehemently. If the president loses, the left wins, our country will stagnate, and Mr. Trump will be a one term president. Yes, the country is at war. Maybe not a war of deadly force, at least not yet, but the determination by both sides is something to recognize. Such histrionics may be interesting to watch, but there are substantial risks at stake for the country. Do not kid yourself, it is no longer business as usual in Washington, this is a life or death struggle for the direction of the country. NEXT UP: EXPLAINING JACK BENNY – And his lesson of teamwork. LAST TIME: THE PERILS OF PERSONAL HYGIENE – If you start to notice people starting to avoid you, perhaps it is time to invest in a bar of soap. This entry was posted on April 5, 2017 at 8:00 am	and is filed under Politics. Tagged: Florida, OH! WHAT A LOVELY WAR, palm harbor, The Bryce is Right, tim bryce. You can follow any responses to this entry through the RSS 2.0 feed. You can leave a response, or trackback from your own site.